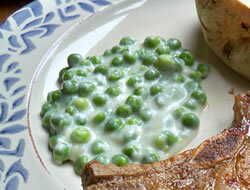 Sweet peas served with a rich cream sauce make this a perfect side dish. Its delightfully rich flavor will have you going back for more. 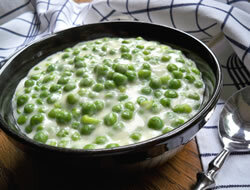 In a medium saucepan over medium high heat, combine peas, salt and water. Bring mixture to a boil. Reduce heat and stir in butter. In a small bowl, whisk together heavy cream, flour and sugar. 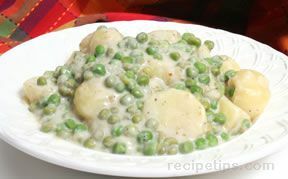 Stir cream mixture into the peas. Cook over medium high heat until mixture has thickened and bubbles, about 5 minutes. Note: Half-&-half can be substituted for the heavy whipping cream if desired. This will reduce the amount of fat slightly. "Loved these peas. Easy to make and so rich and delicious. 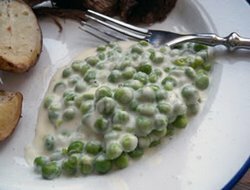 A great way to dress up peas."